Looks like some nuts await completion of new bridge railings. Here’s some local-local news of interest to North Albany commuters: With any kind of luck, North Albany Road might be open to through traffic by the time you drive home Tuesday. Staci Belcastro of the Albany Public Works Department updated the city council on this road Monday. When I asked her later, she said she understood the road could be reopened by mid-morning Tuesday, or as soon as new traffic signal is activated. 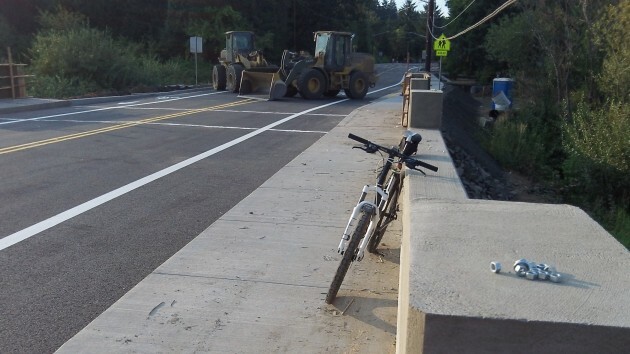 I toured the new pavement on my bike Monday night, squeezing past the two pieces of heavy equipment left in place to prevent motorists from doing the same. As you would expect from brand-new asphalt, it looks good. North Albany Road was closed to through traffic on June 12 so it and the bridge across Thornton Lakes could be rebuilt and widened. The city at the time hoped to reopen it by the Friday before Labor Day. If the road does open Tuesday, Emery & Sons Construction Co. and its subs will have managed to beat that deadline by a week and three days. Emery had the roughly $6.6 million contract to reconstruct 3,000 feet of the road and install a water main nearby. Adjacent to the driving lanes, work remains to be finished on the sidewalks and other details. Over on Spring Hill, a roundabout at Quarry Road, improvised to handle detour traffic, will stay, the city council and Benton County commissioners agreed at a joint meeting last week. Benton Public Works originally said the feature was too small to function well, and it clearly is, as drivers have discovered. Now county officials say they’ll eventually try to acquire enough property to make it into a proper roundabout. 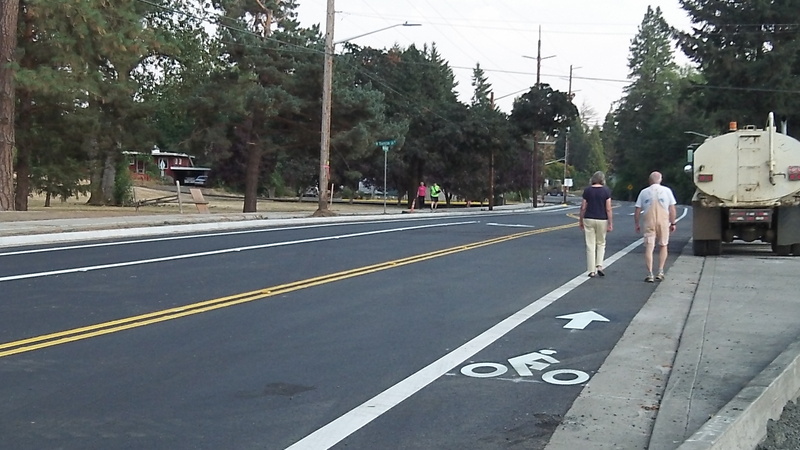 Walkers sample the new pavement on North Albany Road Monday evening. The oval-a-bout did not slow traffic at all for those of us off of Springhill Dr. between Quarry and Hickory. What it did do was create a steady stream of traffic that made it near impossible to turn onto Springhill at times. A 4-way stop would be a better traffic device. That and a widened approach to Highway 20 with a right-hand turn lane. It’s nice to see that up on the hill a sidewalk was constructed over the summer, but nothing of the sort for the residential area along Springhill Drive between Quarry and Hickory. It all looks nice and has been done with a minimum of disruption to those who have to use N. Albany Rd and Gibson Hill Rd. Has anyone else noticed that there will be no sidewalk on the west side of N. Albany Rd. from just north of Quarry Rd. to the Roundabout at N. Albany and Gibson Hill Rds???? It would have been too expensive to add more fill to accommodate a sidewalk. This should have been thought of when the roundabout and that section of roadway was put in a few years ago. so now the residents on springhill can know what N. Albany rd traffic is like all the time except you didn’t have any school traffic like the 9 school bus parades in the morning and afternoon and each one stops at the RR tracks and opens up the doors before it can move. I drive a school bus for Albany. The school buses are required by LAW to stop at each and every RR crossing here in town and yes, the LAW also requires that the school bus student doors are opened and then closed. This serves a two fold purpose. First, the doors are opened in order to assist the driver to hear if there are any oncoming trains. Secondly, the doors are opened in the event that the students must exit the bus in the event of an emergency. There is nothing more important than the safe transport of our children. So, Mr. Hueglin, please respect this and have patience. These laws are required and designed for the student’s safety. The new school year is upon us soon. If you don’t have the patience to wait for the school bus to operate as mandated by LAW, may I suggest you plan your day’s schedule to avoid them. Thank yo for your anticipated cooperation. I think you misread the intent of Mr Heuglin’s comment. I saw no disrespect of the students’ safety, nor your performance in your job in his comment, and am pleased that you take your job of seeing to the safe transport of our children so seriously. We recognize that the inconvenience is indeed a necessary inconvenience, but an inconvenience nonetheless. The LAWS you and Mr. Hueglin refer to have been the LAW for as long as I can remember in my 60 years, so nothing new here, or the reasoning behind them. We get it. And just for your reference, as a resident that not only went to North Albany schools beginning in 1962, but also as an adult that used North Albany Road for many years as a commuter, many of us who find the 9 bus convoys annoying are indeed well versed in “school bus avoidance.” and the schedules. I would suggest that there might be ways to make the issues Mr. Hueglin raises a little easier to deal with, like creating some space between the buses when in convoy mode, without compromising safety one iota. They always seem to leave NAMS “en masse.” It’s been that way since I was in school there. I appreciate your opinion. However, I must disagree with your statement that I misread the intent of Mr. Hueglin’s comment. My response to his comment was to explain, in the simplest way possible, why school buses stop at RR crossings and open their doors. There was no personal affront taken based upon his comment. It has been my observation that unfortunately, there are motorists who are naive to the law. There also are motorists who have shown blatant disregard for the law and student safety. For example, motorists who drive through school bus Stop signs on the bus when they are extended and our lights are flashing. This happens far too frequently and is so dangerous. I would like to see our local newspapers do an in-depth story on school bus laws and perhaps educate the motoring public on why it is imperative that everyone pay attention to what is happening out there on our roads and do their part to help keep the students safe. Simple reminders that the school year is starting are not enough. The new school year is upon all of us. Here’s to a safe, new school year.